The audience was full, both young and old sat waiting to be entertained. Again the hall was full of technology; lights, mixing decks with a whole host of people working them. My greeting had been warm and the atmosphere was of both enjoyment and anticipation. As I sat waiting for the start, I could not help thinking just how important everybody’s role was to make this year’s production. Without each individual, offer of help or donation it simply would not run each year. 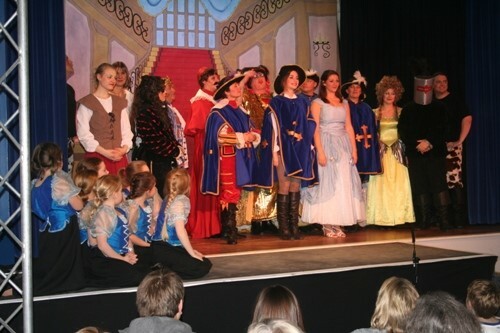 The panto started in darkness and the arrival of the first character. It was all very loud and scary, so much so I could feel the hairs stand up on the back of my neck. Within minutes the audience were encouraged to participate which I thought was great. This was all happening even before the curtain was raised! When the curtains did open it was almost magical. There was the first song before the arrival of the Dame. Crucially, the jokes suited all age groups and there was no shortage of them. Audience participation continued with the Cardinal, Dame and Musketeers’ making the audience eat out of the palms of their hands. What struck me was that as the performance progressed, there was always something new and surprising happening. There were no long scenes and the whole show was running with both speed and accuracy. Each song was strong enough to be of ‘X Factor’ quality. Each person acting or in the chorus could be in a West End Show. The scenery was amazing and the fighting scenes were realistic. So much so, I realised why the Bishopthorpe First Responders were at the back of the hall!! In the second half, both the quality and momentum kept going. There were lots more surprises in store such as the custard pies and clever use of Buttercup the horse to create that something extra special. Sat in the audience I felt part of what was going on from the very first moment. As the final scenes came I could see that the audience had also been mesmerised for over two and a half hours. The sad part for everybody would be having to go home. Every actor and every person working behind the scenes had done a fabulous job. I cannot wait for next year’s production and as always will look forward to ‘Ebor Players’ announcement. In my opinion the productions are always amazing and once again all those involved should be very proud.